Change Your Life for the Better! Request a Sample Today! Are you ready to up your garment decoration game? Good! We’re here to help. At Specialty Materials, we offer samples to those in the garment decoration industry as a service to empower you to choose the correct material and/or color for the job. We’re excited for you try for yourself the difference our well-made products make! 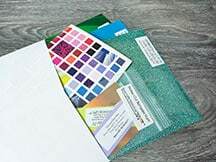 Thermoflex and Decorative samples are 7.5″ by 10″ in size and ThermoFlex Fashion Patterns samples are smaller strips since they are sold in sheet form. Color Card Books are $15 retail and we will need to get your credit card information before sending. If you would like to purchase one, please call 918-359-3305 and ask for either Liz, Rachel, or JD. Processing time is anywhere from 2-5 business days and most samples are sent via US Mail, so there is no way for us to provide tracking. If you are requesting samples without the intention of buying our products, don’t. We provide samples to our customers as a service to assist them in finding the perfect product. If you are in need of a distributor, we are happy to provide you with information for those in your area! Simply ask in the “Message” section. Questions? Tech Support is here to help! For after hours support, we will respond in one business day. Current Distributor / How did you hear about us? What kind of equipment are you using to cut your material? What kind of equipment are you using to print? Don't want to use the form? Email us instead! Remember to include your name, address, phone number, and what three samples you’d like! Simple form to fill out and get a product sample mailed directly to you! Stay up-to-date with the newest products and colors!